1. Combine flour and salt to a bowl; add 3 eggs and oil, mixing with a fork to form a firm dough. 2. Knead on lightly floured board until smooth, about 5 minutes. 3. Cover; let dough rest 5 minutes. Roll dough into a 12x18-inch rectangle; cut into eighteen 4x3-inch rectangles. 4. Cover; let dough rest 1 hour. Boil salted water in a large pan; cook rectangles of dough, a few at a time, 5 minutes, or until tender. 5. Rinse in cold water; drain on damp towel. Meanwhile, prepare sauce: A. 6. Cook onion, garlic and basil in butter in a saucepan until tender. 7. Add tomatoes; bring to a boil. C. Reduce heat; simmer 30 minutes, stirring occasionally. 8. Pour 1 cup sauce in the bottom of a 3-quart 13x9x2-inch baking dish. 9. To make filling: A. Combine soup, milk and Parmesan cheese in a bowl. 10. Combine 1/2 cup soup mixture and remaining ingredients in a saucepan; cook, stirring, until thickened. 11. 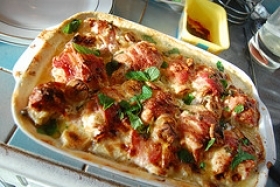 To make cannelloni: Spoon 2 tablespoons filling on narrow end of each piece of pasta; roll up. 12. 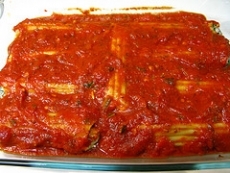 Place roll-ups, seam-side down, in a baking dish; spoon remaining soup mixture and sauce over cannelloni. 13. Bake in preheated 350 F oven 30 to 35 minutes, or until hot. This recipe is high in Vitamin A with 36% of your daily recommended intake per serving. This recipe is high in Vitamin C with 63% of your daily recommended intake per serving. This recipe contains potential food allergens and will effect people with Wheat, Egg, Milk, Gluten, Tomato, MSG, Cheese, Garlic, Beef, Onion, Olive Oil allergies.